Once again this morning, some of the most incisive comments on the saga of North Carolina’s LGBTQ discrimination law can be found on the sports page — in this case the sports page of Raleigh’s News & Observer. “In politics, as in sports, you don’t always get what you deserve. North Carolina got what it needed from the NCAA on Tuesday, but not what it deserved. If the NCAA was serious about honoring the commitment it made to LGBT rights back in September when it pulled this year’s events from North Carolina and threatened to exclude the state entirely from this round of bidding, it would have found a way to reward North Carolina for acknowledging the error of its ways while still punishing it for not fully repealing House Bill 2, some interim position designed to encourage the state to be more welcoming to the NCAA’s constituents. That’s not what happened. North Carolina went right back to most favored nation status with the NCAA over the four-year bid cycle announced Tuesday, landing 26 events encompassing 35 different championships, including the beloved first and second rounds of the men’s basketball tournament in 2020 and 2021. Only three states were awarded more: Pennsylvania, Florida and Indiana. Ohio, California and Texas were just behind. The NBA, NCAA and ACC were all, to varying degrees, involved in brokering the inadequate compromise known as HB142, a step forward from HB2 but only a partial one, thanks to the unwillingness of the Republican majority to countenance the full, necessary repeal of HB2, and the new deal gave everyone the political cover they needed to get back in business with North Carolina. So they did. Or will shortly, in the case of the NBA. In other words, caring and thinking people have a lot more work to do to bring actual justice and equality to North Carolina. Let’s keep at it. State lawmakers who hoped a repeal compromise of the anti-LGBT law HB2 would be enough to return NCAA championship games to North Carolina got their answer Tuesday. 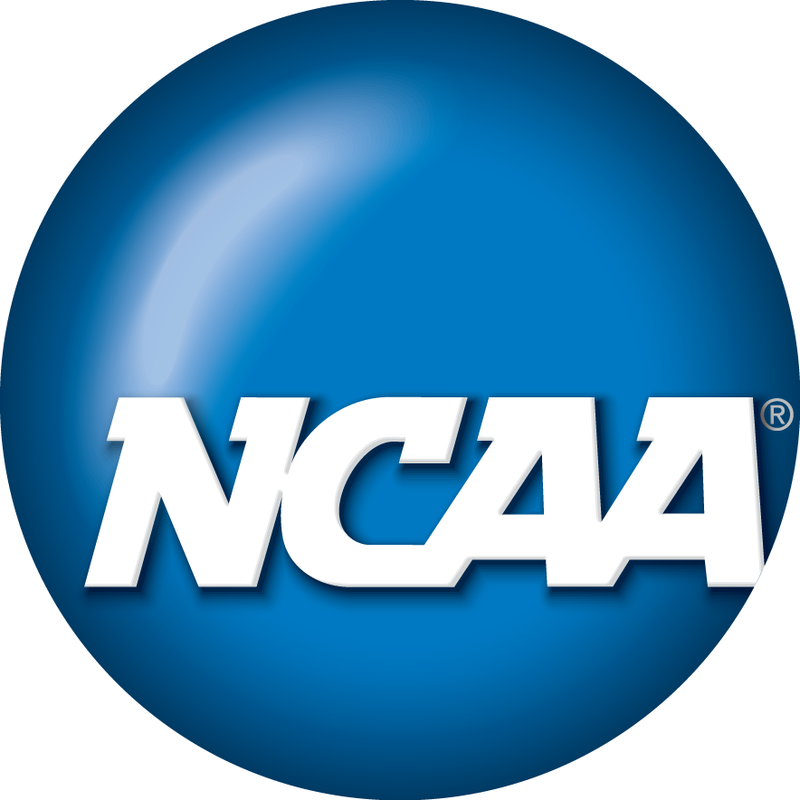 The NCAA announced that post-season soccer games would return to North Carolina in 2018. The far more lucrative first and second rounds of Division I men’s basketball will return in 2020. 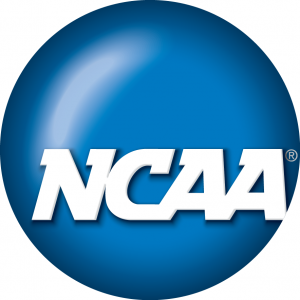 Criteria for selecting the host sites included creating what will be an exceptional experience for the student-athletes, along with adherence to NCAA bid specifications. Specifications can include, but are not limited to, providing optimal facilities; ease of travel to the location and ample lodging; and adherence to NCAA principles, which include providing an atmosphere that is safe and respects the dignity of all attendees. The site selections follow the NCAA Board of Governors’ vote to allow consideration of championship bids in North Carolina. Lawmakers replaced HB2 with House Bill 142 earlier this month, though LGBT advocates called the new law a “sham” as it prevents local governments from passing their own non-discrimination ordinances through 2020. The U.S. Department of Justice filed a motion Friday to withdraw from litigation over House Bill 2, North Carolina’s sweeping anti-LGBTQ law that was repealed and replaced by legislation that accomplishes similar goals. The motion was filed “in light of the passage of North Carolina Session Law 2017-4, House Bill 142,” according to the motion. 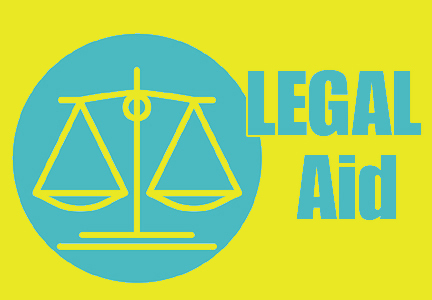 HB142 is the law legislators passed to repeal HB2, but the law also prohibits local governments and other public entities (like the university system) from enacting transgender equity ordinance and rules without the legislature’s approval. 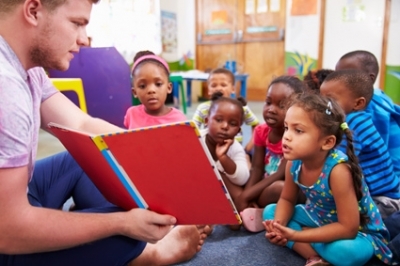 It also makes clear that no local governmental body in the state can “enact or amend any ordinance regulating private employment practices or regulating private accommodations” until 2020. The ACLU, ACLU of North Carolina, and Lambda Legal been working on Carcaño v. McCrory (now known as Carcaño v. Cooper), a federal challenge to HB2, for more than a year. The organizations will continue the fight in court despite the passage of HB142. Barack Obama’s administration also fought HB2 in court, alleging the legislation violated multiple federal laws. President Donald Trump’s administration is a different story. Attorney General Jeff Sessions openly opposes transgender equality and has tried to reverse Obama administration’s protections for LGBTQ individuals. LGBTQ advocates are not pleased with the the DOJ’s decision. 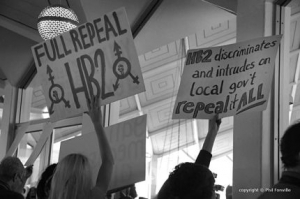 James Esseks, director of the ACLU’s LGBT Project, said that while the DOJ may want to use the “fake repeal” of HB2 as a cover, his organization would continue to fight. “We’ll continue this fight as long as it takes to truly strike down this disastrous law for good,” he said in a news release. The North Carolina GOP praised the DOJ’s litigation decision. “The Trump administration has take a very reasonable and common sense action that is welcomed,” said former governor Pat McCrory in a press release. NC GOP Executive Director Dallas Woodhouse said Americans were “once again” seeing the Trump administration reign in the “hyper-partisan Obama Justice Deparment,” a trend he hopes continues. After North Carolina lawmakers passed House Bill 2, Chris Mosier was faced with a decision about whether or not to compete in one of the most meaningful races of his life because of location. The transgender athlete didn’t feel welcome in the Tarheel state and he was concerned for his safety both in competing and in navigating public spaces outside of his big race. HB2 may be gone, but now HB142 stands firmly in its place, assuring the LGBTQ community will remain without lawful protections in the state of North Carolina. After demanding the HB2 repeal and threatening to leave North Carolina for years to come, the NCAA announced shortly after HB142’s passage that championships would return to the state. The organization noted that lawmakers met its bare minimum requirements to be considered a venue. LGBTQ advocates, including Mosier, have criticized the sports organization’s decision to “reward” North Carolina for the charade of repealing the sweeping anti-LGBTQ legislation. They’ve also said it sends a message to other states considering similar “bathroom bills” that there won’t be repercussions. 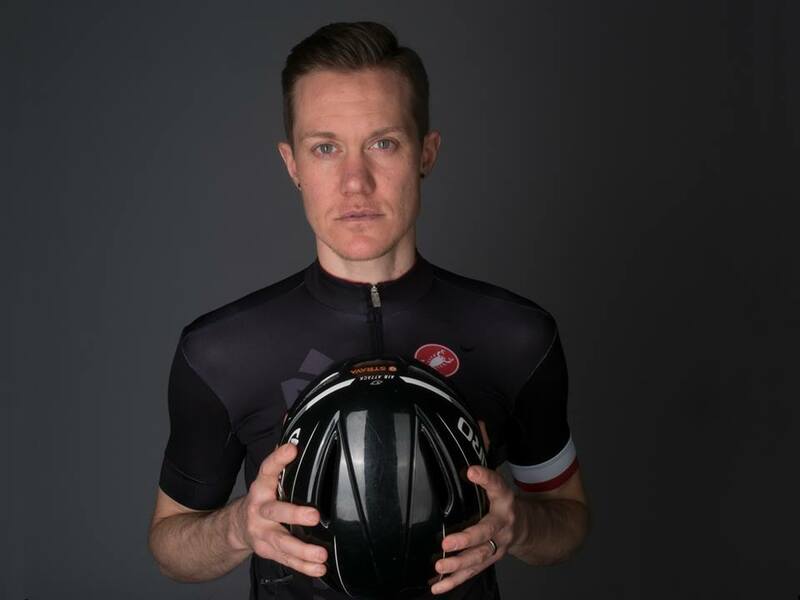 “As a transgender athlete, it feels like HB142 puts me at risk for discrimination, harassment and exclusion,” Mosier said. He became the first transgender athlete to represent America after earning a spot on the Team USA sprint duathlon men’s team for the 2016 World Championship. He is also a coach and the vice president of the You Can Play Project, which represents LGBTQ athletes. Because of HB142, Mosier has once again been faced with the decision about whether or not to compete in North Carolina, but he made clear on a conference call last week that he’s not sitting this race out. He will return to Cary on April 28 to compete in the Cary Du Classic race. The ACLU organized the conference call. The organization is fighting the NCAA’s decision to return to North Carolina and fighting for LGBTQ communities to have lawful protections both in the state and across the country. When Mosier attended the race last year, he gassed up at the border, before entering North Carolina, went straight to his hotel, then went from the hotel to the race, from the race to the hotel and then went home. He didn’t spend any money in the state and was uncomfortable in that setting. “Most of my competitors were not focusing on these things in the critical days and moments leading up to our race,” he added. He said when he first transitioned categories in sports in 2010, he excelled after getting acceptance from his teammates and competitors. He said when he was in North Carolina last year, he didn’t even wear his regular uniform that said “Mosier U.S.A.” because he didn’t want to be a target after speaking out against HB2. “Imagine being at the starting line at one of, if not the most, important sporting events of your career and being worried about being attacked or being harassed,” he said. Competing without fear, having access to locker rooms and public spaces are critical components of achievement for an athlete, and North Carolina does not offer that with HB142 in place, according to Mosier. Mosier wants to believe the NCAA values inclusion. In fact, he has presented twice at NCAA inclusion conferences. “I know there are good people doing great work at NCAA about inclusion, and that was not part of this conversation and that was not reflected in the outcome of them returning back to North Carolina,” he said. Mosier said the LGBTQ community’s protection should not be an afterthought, adding that the values instilled in sports participants do not line up with North Carolina’s intolerance and discrimination. 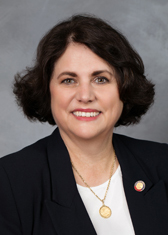 Welborn, a Republican member of the Guilford County Board of Education, says her district—the third largest in the state—will need to find an additional $16.6 million and 242 new teaching positions to meet the state’s legislative mandate to cut class sizes for kindergarten through third grade beginning next school year. Now that HB2 has been partially repealed, enough for the NCAA and ACC anyway, a lot of folks in Raleigh are hoping the issue of discrimination in North Carolina goes away for a while, at least for the four years that local governments must now wait before protecting LGBTQ people from being fired or denied services because of their sexual orientation. Most legislative leaders don’t want to talk about it and when they do they continue to mislead the public about their justification for allowing discrimination to remain in place until at least 2020. No one ever accused Donald Trump of being consistent. If ever there was a politician for whom a gravitation toward blatant self-contradiction and 180 degree flip flops was embedded in the very fiber of his being, it would have to be the 45th president. Name an important issue of public policy and it seems a virtual lock that Trump will have staked out a position on all sides of it (and then probably contradicted each of them at one time or another with his own personal behavior). 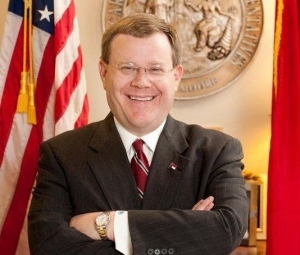 In his next career, House Speaker Tim Moore should become a magician. On Thursday afternoon, a procedural sleight of hand wound up fast-tracking a controversial — and possibly unconstitutional — agriculture bill through its second reading. House Bill 467 would limit the amount of damages plaintiffs could receive in litigation against hog farms. Under the measure, citizens could not sue over “quality of life” issues, such as odor. Payouts would be limited to the decrease in a property’s fair market or fair rental value. The bill would not only clamp down on future lawsuits but also the 26 that are pending against Murphy-Brown, which owns Smithfield Foods. It is being supported by several industry groups, including the NC Pork Council and the NC Farm Bureau. Tragically, however, things have gone from badly flawed to dreadful under the administration of Donald Trump.